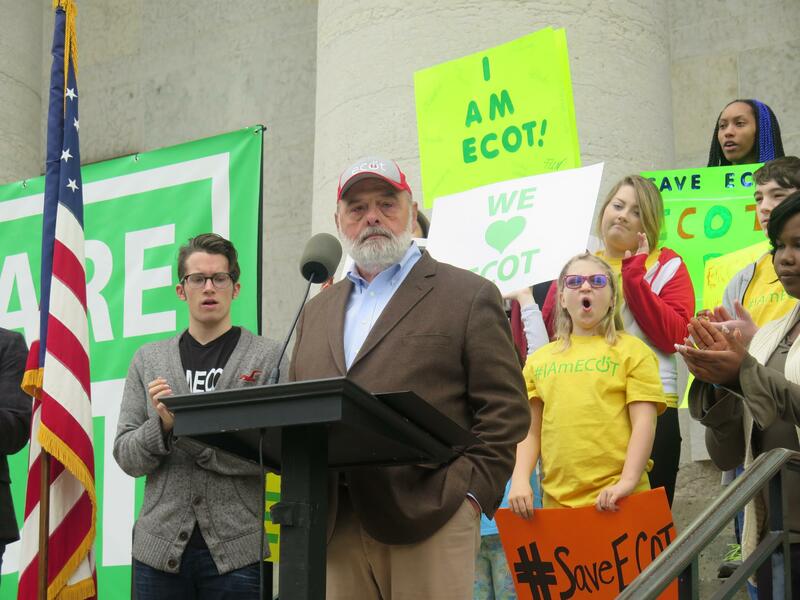 ECOT founder Bill Lager speaks to the crowd of students, parents and teachers. 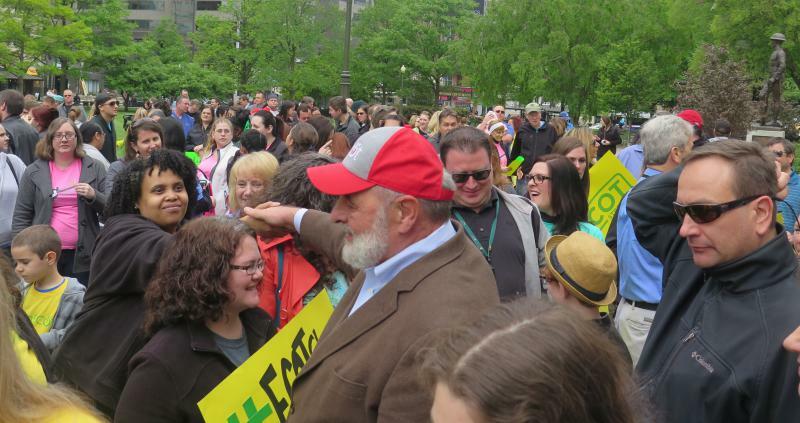 ECOT founder Bill Lager shakes hands walking through the crowd. Nine-year-old Hannah Sims of Wapakoneta leads the pledge of allegiance. 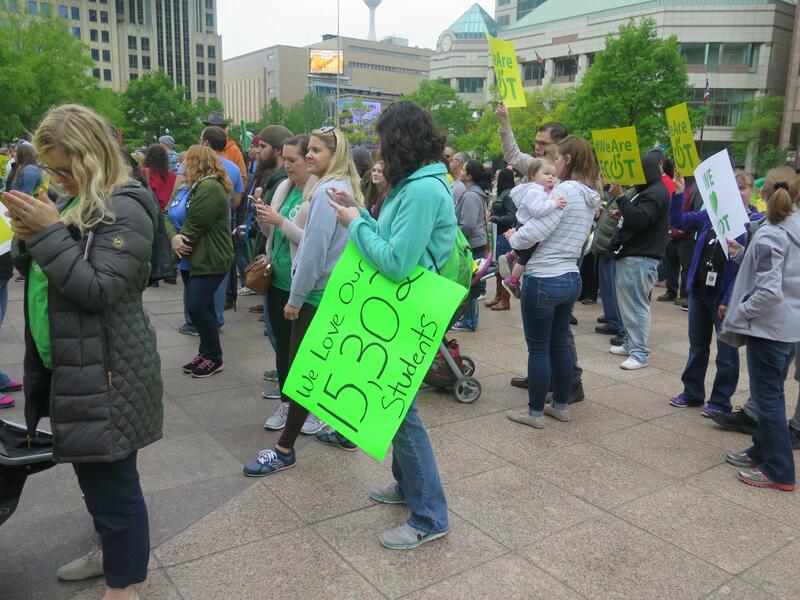 Denise Sims (center) holds a sign at the ECOT rally. An rally attendee holds a sign referencing ECOT's enrollment, which is disputed by the state. ECOT board president Andrew Brush speaks to the crowd. A protestor from the liberal leaning group Progress Ohio is removed before the rally. 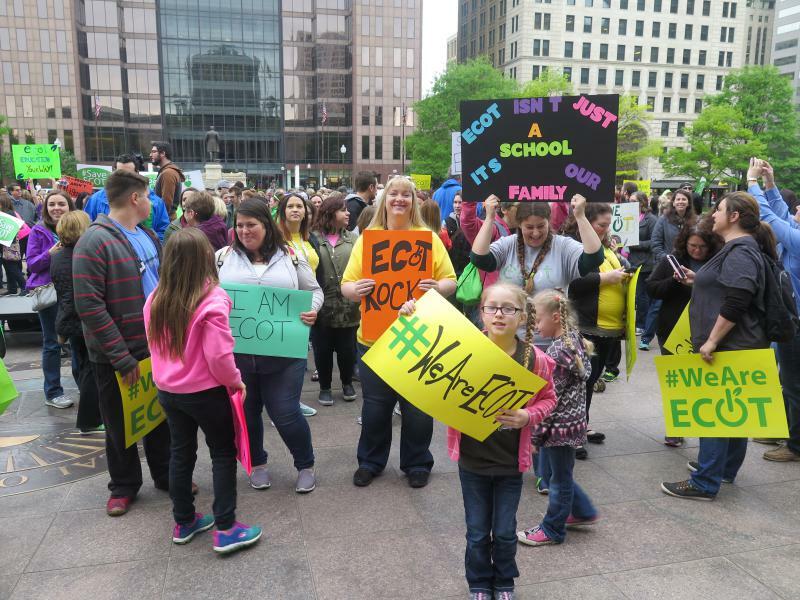 Several hundred students, parents and teachers rallied for ECOT at the Statehouse. 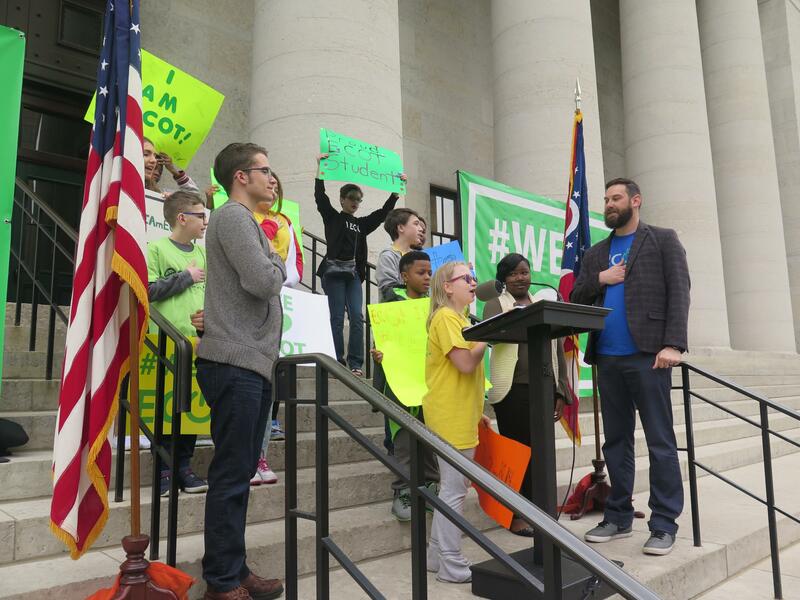 Hannah Sims of Wapakoneta is about to turn 10 years old, has ADHD, and is an enthusiastic ECOT student. 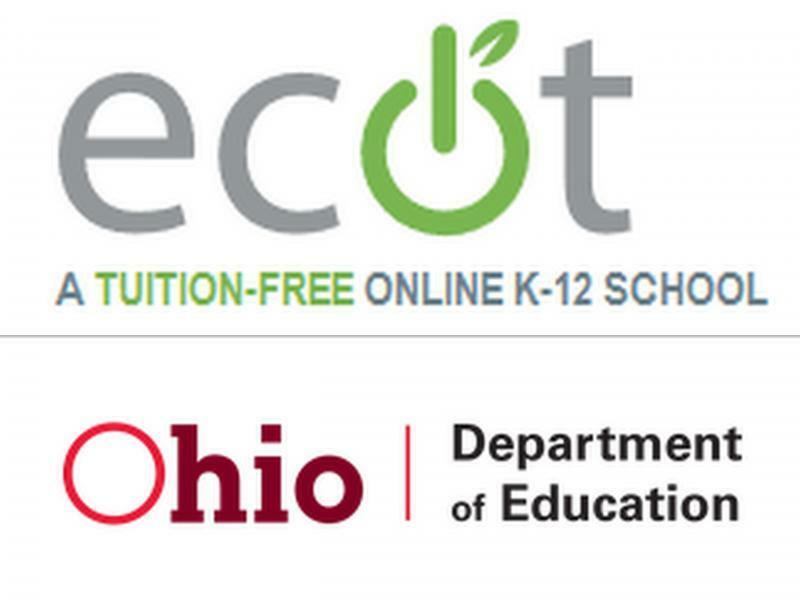 “ECOT helps me understand my homework a lot better, because in a building school I could not – I could not. I would get Fs every single day,” Hannah said. 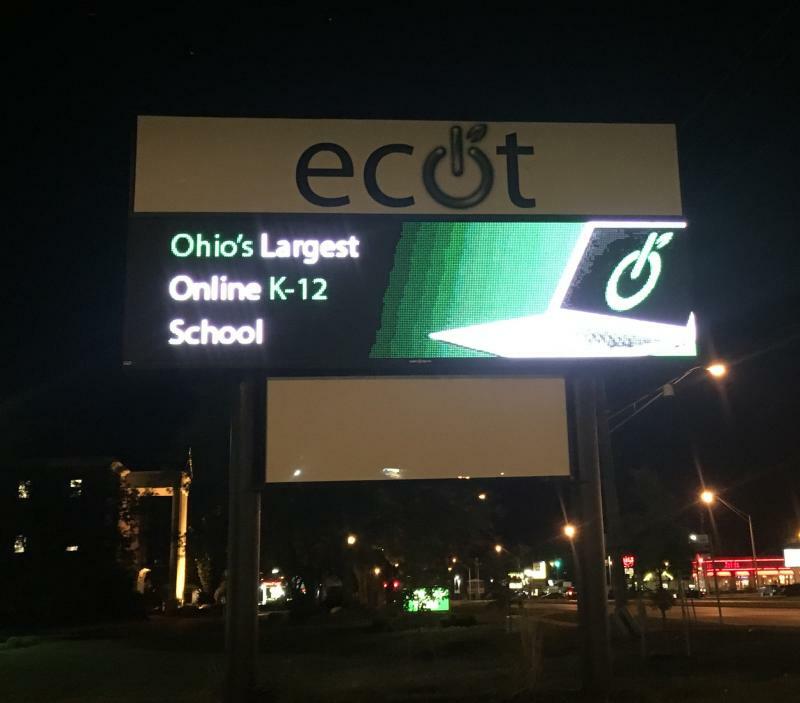 ECOT has a graduation rate under 40%, and claims to graduate more students than any other school in Ohio – but the Columbus City Schools and Public Schools have more graduates. 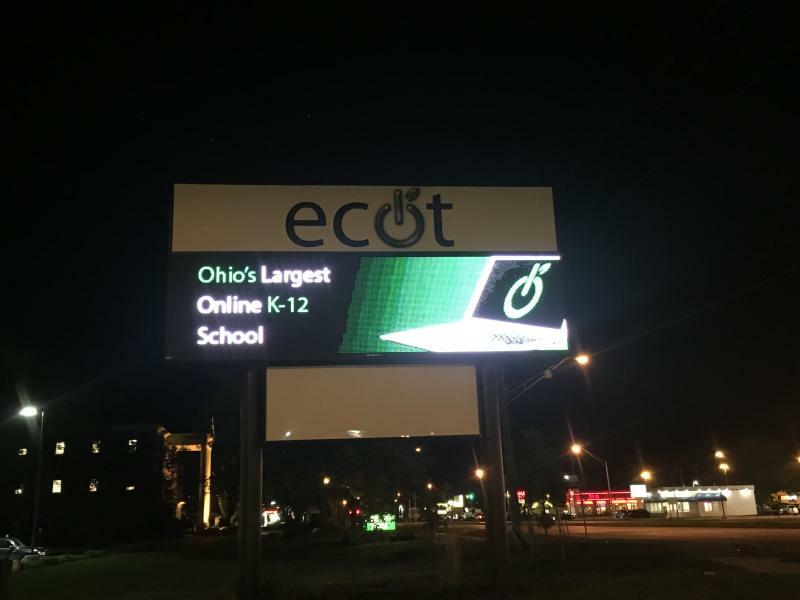 And while ECOT does have a large number of graduates each year, federal data shows more students drop out of ECOT than any other school in the country. 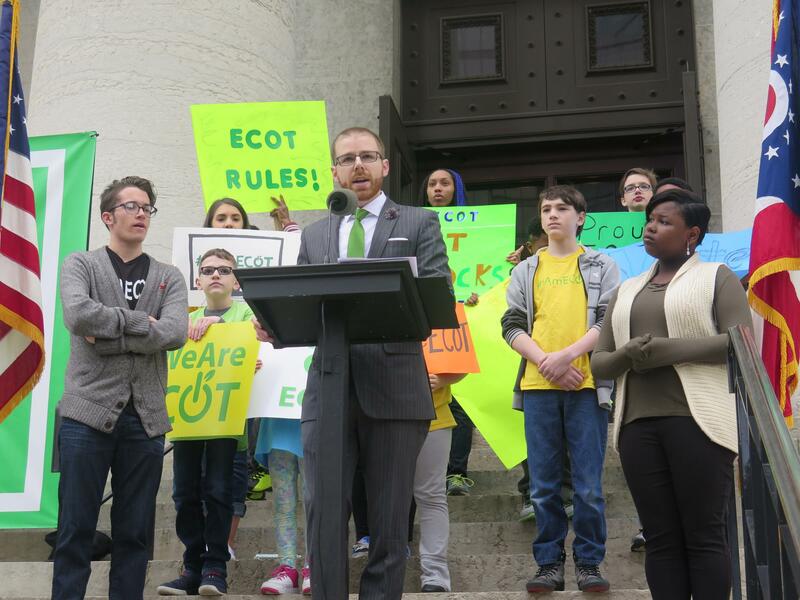 ECOT has been lobbying hard for itself, through taxpayer-funded ads featuring students. 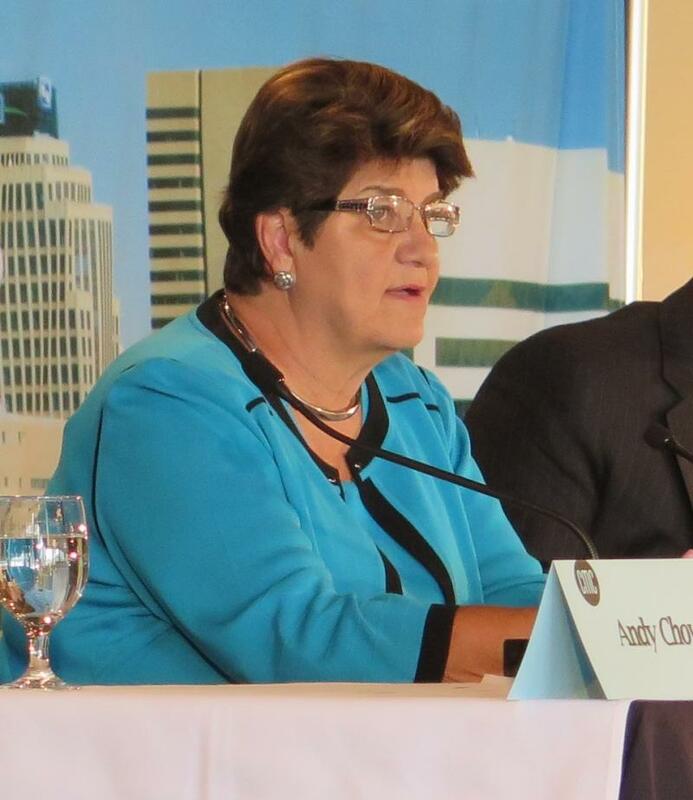 But one person not often heard from is ECOT’s founder Bill Lager. Lager, who’s donated millions to mostly Republican lawmakers and candidates, rarely makes public appearances, but at this rally he spoke out. Lager said every family in Ohio knows a child who wants an education outside of a traditional public school. ”That’s what ECOT is. That’s what ECOT always will be,” said Lager. Lager was emotional as he described creating the school to help kids who are chronically ill or have trouble learning. And he blasted the state when saying ECOT fits in with the predictions from his favorite book, Alvin Toffler’s “Future Shock”. 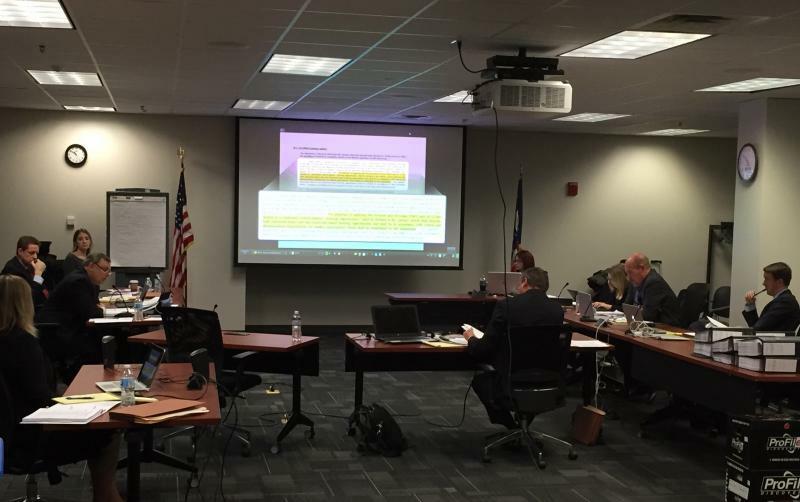 “And yet here we are, seventeen years later from 2000, trying to explain to the traditional 1850s school board that that’s the way our kids want it,” Lager said. 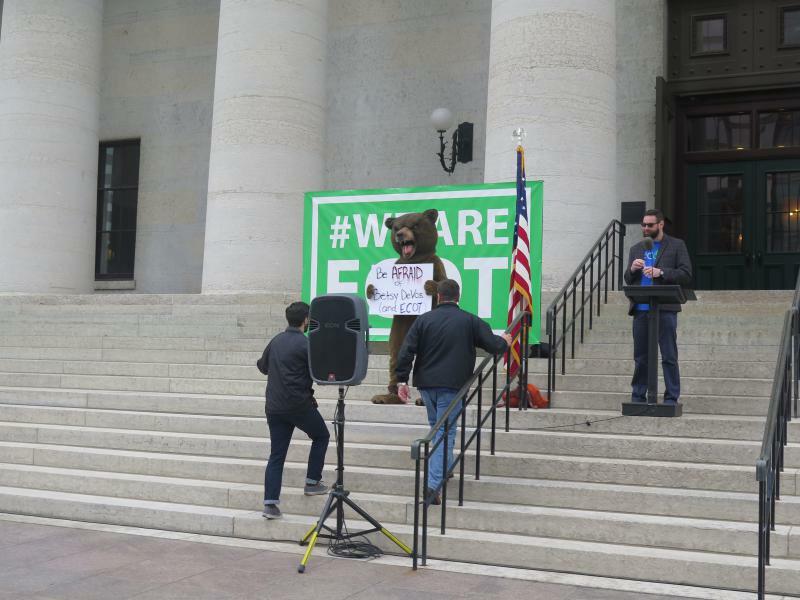 Buses had been provided to take students from ECOT’s Columbus offices to the Statehouse here were reports that teachers were required to attend the rally, but several teachers at the event denied that and the school said attendance was voluntary. The state education department says Ohio's largest online charter school severely over-reported how many students actually attended class full time. But the school says the state's report is a slap in the face to a pending court battle.